"Gillman is a masterly storyteller" able to "carve out entire street scenes with single gestures and the fewest of words. Everything about him -- his body, his voice, his choice of movements -- has a breathtaking economy that lets the simplicity of the story speak for itself. He has a quietly demanding presence." "All in all, the incredible scope of Mr. Gillman's talents, the love of nature and Mt. Desert Island that permeates his routines, and the warmth of his relationship with the audience make an evening with Jackson well worthwhile." 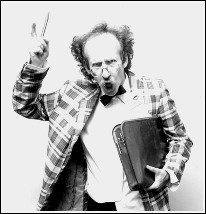 "Jackson Gillman is a very funny fellow... a zany kind of comic mutant -- what you'd get if you worked up a mold for an entertainer that was one part mime and actor, one part stand-up comedian, and one part sheer storyteller."